This is Eric calling from Lava Tower Camp at 15,090ft/4600m. We had a nice hike today and are now relaxing now at camp. Everything is going well. 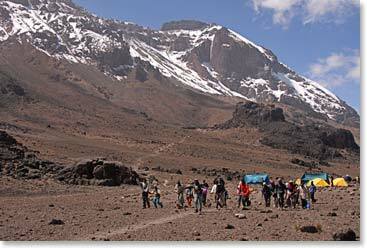 The team is very happy and strong; everyone is acclimatizing well. Our chef is cooking very good food and everyone continues to eat well. 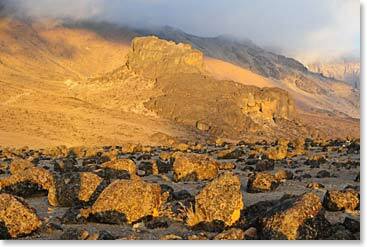 Tomorrow we will be hiking to Karanga Camp which is at a lower elevation than Lava Tower Camp, but that doesn’t mean we won’t be gaining any elevation tomorrow. 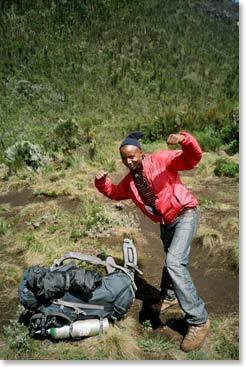 We will need to climb up the 800ft/244m Barranco Wall before descending into the scenic Karanga Valley. It will be a long and exciting day. We will check-in again soon.